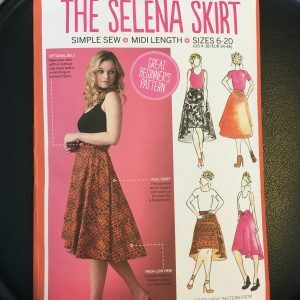 I have been living in skirts and dresses this summer and when I saw the Selena skirt pattern that came free with Simply Sewing magazine, I knew I wanted to give it a go. 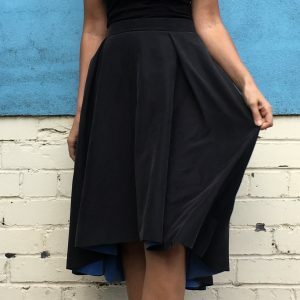 As the hem of the skirt is higher at the front than it is at the back, you would be able to see the seams on the inside so they need to be really pretty. I would recommend doing French seams, rather than overlocking the edges. 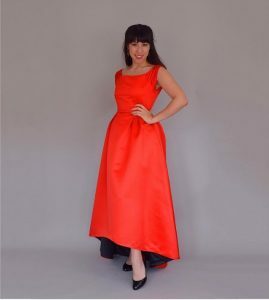 I was very much inspired to line my skirt in a contrasting colour by the lovely Nina from Thumblenina, who had made an amazing satin high low hem dress for the Dressmakers Ball. 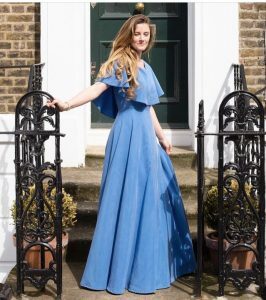 I had also seen Elizalex from By Hand London‘s stunning gown made from blue cupro at the same event and knew I would like to make something from that fabric as it almost looks like silk, while being infinitely easier to work with! 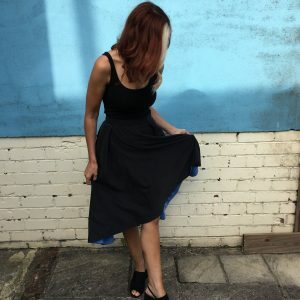 I found some more of the blue cupro from Rainbow Fabric in Kilburn and I bought that along with the smokey black colour way. The original pattern had the zip on one of the side seams but I prefer zips to be at the back so I altered it. I also made the waistband piece longer so that I could add a button, rather than have the zip go all the way to the top, as I prefer that look. I also omitted the tie belt as I thought that would look too fussy. 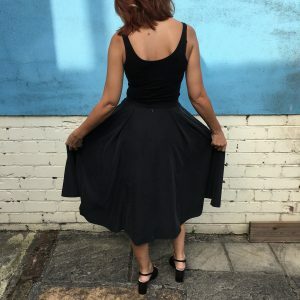 Once I had constructed both the outer skirt and lining skirt, I placed them wrong sides together, and then basted them at the top, before adding the zip and waistband. To hem the skirt, I sewed a line of basting stitched around the hem at a 5/8 inch seam allowance and then pressed up to that line on both the outer skirt and lining. I then hand slip stitched them together for an almost invisible hem. 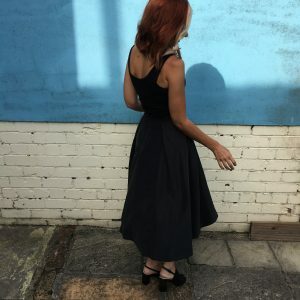 The cupro was really easy to work with and I think the colours really compliment each other. 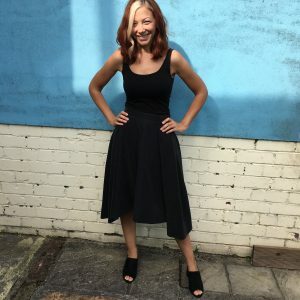 I love how the skirt is very easy to twirl in (always a good test) and I think it looks great both for the office with a cropped cardigan or dressed up for a night out. Lovely to meet you at the weekend. Love your skirt. The contrasting lining is definitely the way to go, it really makes the skirt special. I also like the sound of the way you have done it rather than bagging out as it would be much easier to control. I bet that was quite a lot of handsewing!